ANCIENT BRITAIN, Gallic War imports, (c.58-54 B.C. 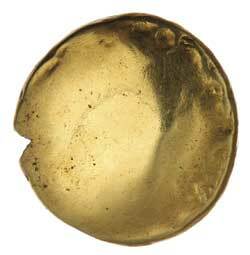 ), Ambiani, uniface gold stater (6.23 g), obv. plain with traces of undertype, rev. 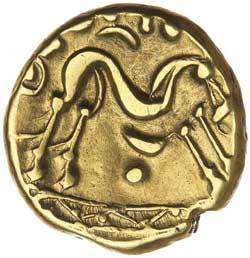 M-shaped Celtic horse right, crescent and pellets above and below, exergual line with zigzag and pellet decoration. (S.11, Sills class 1c, ABC 16 var, LT 8710, Van A 50). Extremely fine or better, attractive metal, smooth flawless surfaces with a full horse and clear exergual decoration. Ex Noble Numismatics Sale 115, (lot 4571). Previously Chris Rudd, list 113, #9. English provenance. This superb example of the uniface stater is one of the early varieties produced when Caesar was attacking the Belgae in 57 B.C. It displays great detail in the exergual zigzag line that is almost complete.